Posted on 04/30/2018 by Parklifer	in Live Review and tagged Big Chief, funk, Funk Parade, Howard Theatre, Lincoln Theatre, music festival, parade, Shaw, U Street Music Hall, Union Stage. Editor’s Note: Funk Parade recent introduced a general festival wristband, providing priority entry into select evening music venues during its showcase on May 12. Funk Parade also will host its first-ever Featured Showcase at the Lincoln Theatre, featuring Ari Lennox, Mannywellz, and more. Buy the General Music Fest Wristband online here, and buy your tickets to the Lincoln Theatre Showcase online here. For other details, Parklife DC presents the full text of a press release issued by Funk Parade on Thursday below. Posted on 04/09/2018 by Parklifer	in Around Town, Live Review and tagged funk, Funk Parade, music festival, parade, Shaw. 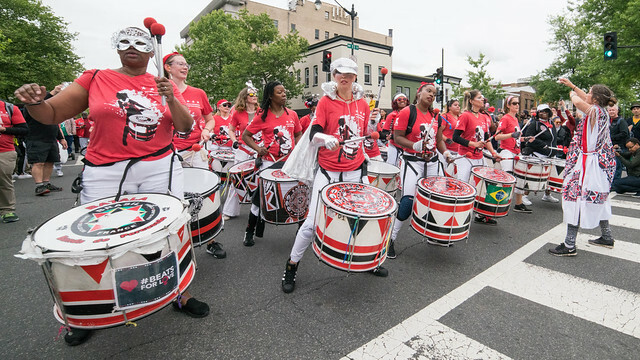 Editor’s note: Parklife DC was glad to receive word Friday that the fifth annual Funk Parade will proceed on Saturday, May 12, after being rescued by a massive-last minute fundraising effort. We present the official press release from Funk Parade in its entirety below. Visit www.funkparade.com for all details! Washington, DC — It’s on. Posted on 03/12/2018 by Parklifer	in Live Review and tagged Chuck Levin's Washington Music Center, crowdfunding, funk, Funk Parade, music festival, parade. The following press release was published by Funk Parade on March 11. Parklife DC shares it in its entirety in support of Funk Parade’s crowdfunding effort. A longstanding DC music institution has stepped in to help save a new one. Chuck Levin’s Washington Music Center, the independent music and equipment retail giant which has called the DC area home for 60 years, has pledged to match new crowdfunding contributions to save the DC Funk Parade. The campaign can be found at https://www.youcaring.com/funkparade. Posted on 04/06/2015 by Mickey McCarter	in Live Review and tagged funk, Funk Parade, Justin Rood, Muriel Bowser, music festival, street fair, U Street Music Hall. 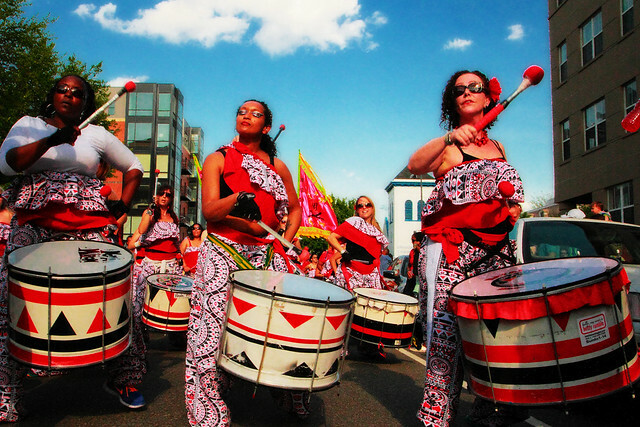 The second annual Funk Parade promises to be even funkier than the first. The street and music festival certainly impressed enough people in its inaugural year to convince Mayor Muriel Bowser to close U Street NW on Saturday, May 2 for the daylong festival. 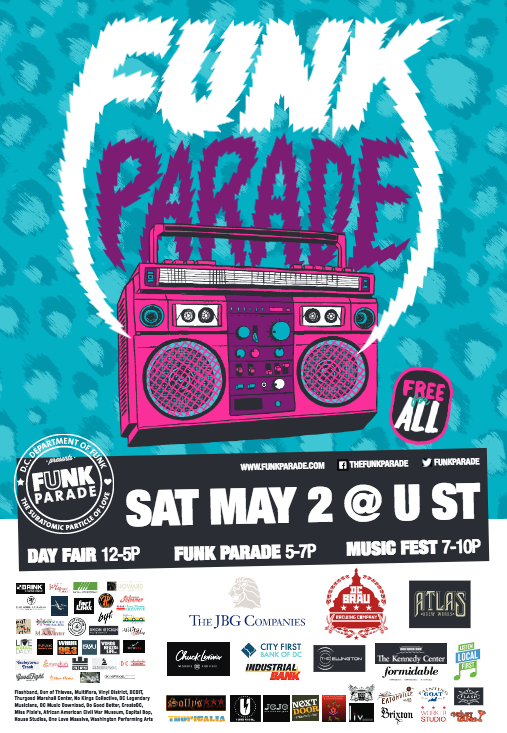 The Funk Parade organizers sought to close down U Street for their parade last year as well, but they were denied by then-Mayor Vince Grey. With this year’s closing, U Street will shut down for the first time in 17 years, according to reports. “We’re grateful to the city and Mayor Muriel Bowser for acknowledging U Street’s historic significance to the District as the soul of music, culture and celebration, a place that’s unlike anywhere else in the city,” said Justin Rood, co-founder of Funk Parade, in the press release. Rood and fellow co-founder Chris Naoum of Listen Local First have been running an Indiegogo campaign to raise $15,000 for the Funk Parade. As of this morning, it has raised roughly $9,300 toward that goal with only four days of fundraising remaining. 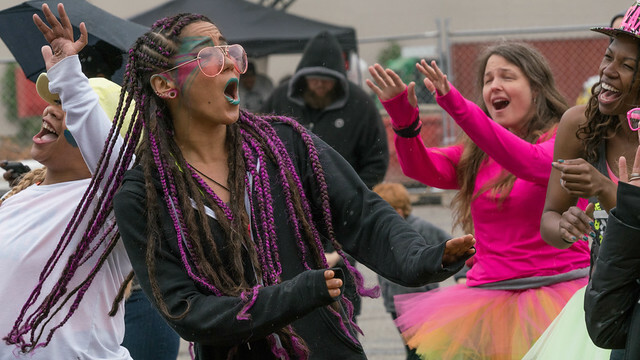 The organizes estimate last year’s Funk Parade drew more than 25,000 participants with more than 100 hours of music programming from more than four dozen acts in 30 locations throughout the day. 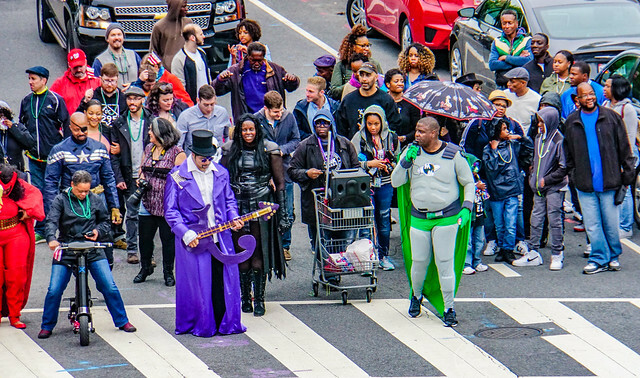 The literal Funk Parade marched down V Street NW last year after Grey denied its application to march down U Street. Funk Parade activities planned for May 2 include a day fair, the parade, and a music festival. Day Fair (12-5pm): Before the parade, the neighborhood will host a day fair, full of music, dance, art, and spontaneous acts of soul and creativity. It’s a chance to gather and celebrate and prepare for the mighty parade! The Main Event – Funk Parade (5-7pm): See dancers, your friends and neighbors, a marching band behind them, and a drum corps. See costumes and getups and shiny things. Hear beat-boxers and junkyard drummers. See pot-bangers and clappers and kids on their parents’ shoulders. Horn players wander in and out of the crowd. A thunderous syncopated procession of groove, winding its way through the neighborhood, calling the city to the funk. Music Festival (7-10pm): After the parade winds down, the U Street neighborhood’s historic venues open their doors for the city to hear some of the best music DC has to offer. One night, one city, one groove: the subatomic particle of love.